Although it sounds like a yawn, meal automation is one of the keys to eating healthfully on a regular basis. Master a few nourishing recipes, and prepare them regularly to avoid the need to grab grub at the local fast food joint when hunger pangs strike. The secret to sticking with the plan is to vary the recipes by looking to global ingredient combinations and seasonings. Read on for a few of my mainstays and creative ways to spice them up. For a light lunch or starter, whip up a cold soup starring seasonal or frozen veggies. I love to use vegetable scraps, such as peeled broccoli or cauliflower stalks and even fresh parsley or cilantro stems. Since we eat with our eyes, remember to include only vegetables in the same color group at one time for brightly hued results. To prepare, sauté chopped onion and garlic in a small amount of olive oil in a medium saucepot over medium heat. When softened, add other vegetables, such as trimmed, peeled and chopped broccoli or cauliflower stalks, and sauté until softened (but still vibrant in color). Add peas (if frozen, thaw and drain first), water or low-sodium vegetable or chicken stock, salt, and pepper, and bring to a boil over high heat. Carefully transfer to a high-speed blender, and puree until smooth, for about two minutes. If desired, top with cow or nut milk yogurt. To vary this formula, go orange: Add ginger to the onion and garlic. Instead of broccoli, use chopped carrots, perhaps with some peeled, diced apple for sweetness. Season with curry powder. Or, go white: Instead of broccoli, opt for cauliflower with peeled parsnip. Season with a bit of nutmeg. For a healthier take on a take-out staple, prepare your own chicken kebabs. Serve with a simple salad of chopped tomato, bell pepper, cucumber and romaine with a vinaigrette that complements the flavors you choose for the marinade. Begin by stirring plain unsweetened yogurt (cow or nut milk) with fresh lime juice, salt, pepper, and garam masala (an Indian spice mixture). Add cubes of raw boneless, skinless chicken breasts or thighs, and let sit for about 20 minutes. Thread on metal skewers, and transfer to a greased broiler pan. Broil, turning over once, until cooked through, for about 12 minutes. For a Middle Eastern variation, swap lemon juice for lime juice. Instead of the garam masala, season with cumin, coriander and cayenne or one of the following spice mixtures: za’atar, berbere, or ras el hanout. To go Thai, omit the yogurt. Instead, stir together fish sauce, low-sodium soy sauce, fresh lime juice, minced jalapeno chili and a small amount of honey for the marinade. A classic for a reason, roast chicken is comforting—and the perfect canvas for experimentation. 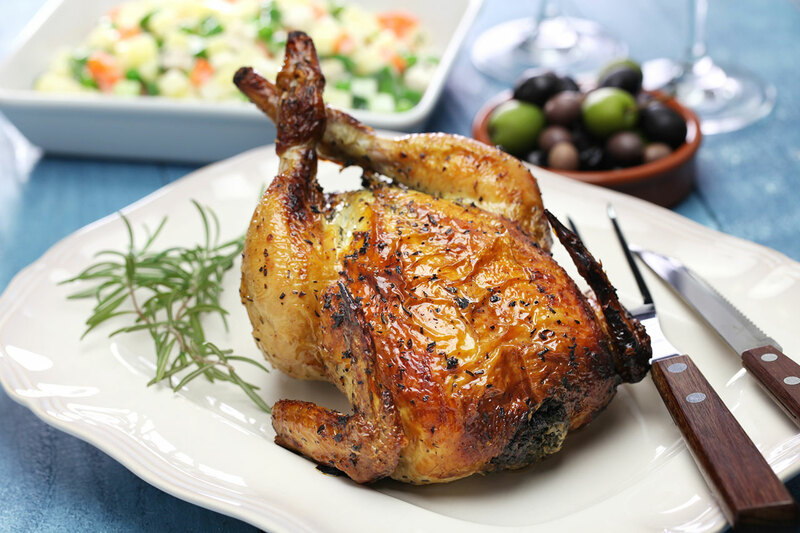 To make it incredibly delicious, purchase an organic or free-range three- or four-pound bird. First, pat the outside until it’s completely dry, and then rub the skin with extra virgin olive oil and sprinkle generously with salt and pepper. Season the cavity with salt and pepper, and stuff it with cut-up lemon, garlic cloves, and fresh rosemary and thyme. Roast the chicken on a greased rack in a preheated 450-degree-Fahrenheit oven for about 20 minutes to brown the skin. Reduce the heat to 350 degrees Fahrenheit, and continue roasting until the internal temperature is 165 degrees Fahrenheit when poked with a meat thermometer, for about another 40 minutes. For a Middle Eastern twist, swap orange for the lemon; omit the herbs; and add salt and pepper along with cumin, cayenne and coriander or one of the following spice mixtures: za’atar, berbere, or ras el hanout. To go all-American, add paprika to the seasoning mixture. In addition to being economical, eggs are versatile and delicious with a relatively long shelf life. Always keep a couple dozen in the fridge to pull out for breakfast, lunch or dinner entrees, such as eggs cooked gently in tomato sauce. Here’s how to prepare it: Bring homemade or jarred tomato sauce (ideally, sweetener-free) to a simmer over medium-high heat in a deep skillet. (I love the brand Rao’s and always stock up on jars when they’re on sale.) Once simmering, crack an egg into a ramekin, and then gently slide the egg into the sauce. Repeat with a few more eggs. Cover the skillet and simmer until the whites are opaque, but the yolks are still molten, for three to five minutes. If desired, sprinkle with chopped fresh herbs, and serve with toasted whole-grain bread. For an Italian spin, first sauté chopped onion, garlic and red bell pepper until softened before adding the sauce. Add finely chopped, fresh oregano leaves to the sauce, or top the finished dish with finely chopped, fresh basil leaves. To go Middle Eastern (known as shakshouka), first sauté chopped onion, garlic and jalapeno pepper until softened before adding the sauce. To the sauce, add cumin, coriander and cayenne pepper or one of the following spice mixtures: za’atar, berbere, or ras el hanout. Sprinkle the finished dish with finely chopped, fresh cilantro leaves. Serve with toasted whole-grain pita. Delicious for breakfast, lunch or dinner, a frittata (or baked omelet) can be eaten cold, hot or at room temperature. If you cut it into small squares, you can even serve it as an appetizer when entertaining. Either way, a frittata is an ideal vehicle for using up extra vegetables—in very little time. The basic method is simple: Sauté chopped onion and garlic in a small amount of extra virgin olive oil over medium-high heat in a 10-inch, nonstick sauté pan. When softened, add other vegetables (such as chopped bell peppers, Swiss chard or zucchini), season with salt and pepper, and sauté until softened. Meanwhile, whisk about eight eggs in a bowl with salt and pepper. Once the vegetables are soft, pour in the egg mixture, and let the frittata cook until the edges set, for about three minutes. Transfer to a preheated 375-degree-Fahrenheit oven, and bake until the eggs are fully cooked, for about 15 minutes. Serve as is, or top with a dollop of cow or nut milk yogurt. For an Italian approach, opt for any combination of chopped bell pepper, Swiss chard, zucchini, broccoli and sun-dried tomato. Add finely chopped, fresh oregano leaves and crushed red chili flakes to the egg mixture. If desired, top with chopped, roasted bell peppers; finely grated Parmigiano-Reggiano; or thinly sliced, fresh mozzarella before transferring to the oven. To go Moroccan, sauté fresh ginger along with the onion and garlic; cook chopped red or orange bell pepper and spinach; and add cayenne, cumin and coriander to the egg mixture. For an Indian take, sauté ginger along with the onion and garlic, add chickpeas or peas to the vegetable mixture, and add garam masala or curry powder to the egg mixture.